If you would rather watch a short video tutorial, click below and just stop reading. If you would rather read through it, then read on! There are five things that you must remember when performing one of these procedures. 2.) Never lose sight of the needle tip. 5.) Secure the line like you mean it. To prepare the transducer, place the tegaderm gently over the ultrasound transducer, making sure that there aren’t any bubbles or wrinkles. The tegaderm is there to keep the area clean, so don’t try and smooth out bubble with your dirty fingers. Usually it’s taught that you don’t need to place any gel on the inside, but Mike Stone mentioned in this years Castlefest that if you do a lot of these, the adhesive on the inside of the tegaderm can eventually break down the transducer surface. The next step is to prep the skin. The way I prep the skin is I get one of the clorhexadine sponges and clean from about 3 inches below the antecubital fossa all the way up to the mid upper arm. I clean anterior, lateral and medial. That way as soon as I find a vein I like I can stick in that IV (I’ve found that saves me previous ED time). After you have found the best vein, make sure it completely collapses under pressure. This way you can 1.) make sure it isn’t an artery and 2.) make sure there isn’t a thrombus in it. If you’re going to go for one of the brachial veins, make sure you know where the median nerve is. If it is directly on top of the vein, don’t impale the nerve. Next, track the vein up and down the arm. The purpose for this is to see how the vein moves in the arm or if there are branch points you want to avoid, and more importantly, to make sure that you know your approach vector. As you move the probe up and down the arm, you want to make sure that the vein stays right in the middle of your ultrasound screen. When you do that, you confirm that your ultrasound transducer is completely perpendicular to the vein, and if your needle is 90 degrees with the transducer, you will be on axis with the vein. I would suggest against using static ultrasound guidance. 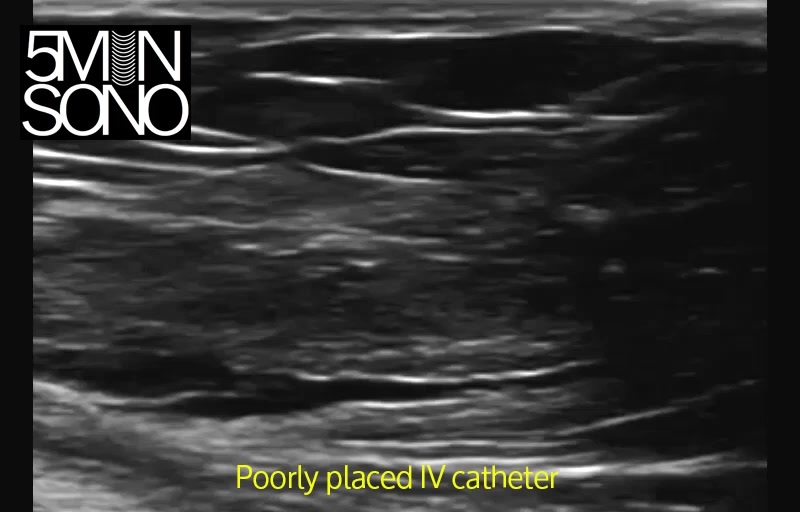 Some studies have looked at using ultrasound to identify the vein, then taking the transducer off the patient and trying to place the IV then. These studies have found that this technique doesn’t do any better than if you didn’t use ultrasound at all.1 It is so much more beneficial to see in real time where you needle is and what the anatomy is doing. After you get a flash, push forward just a millimeter more, then flatten the IV relative to the skin prior to advancing the catheter. You are usually at a relatively acute angle when doing this, and if you don’t flatten the IV prior to advancing the catheter, you are more likely to go through the posterior wall of the vein. What happens after you’re successful? So you’ve gotten a flash, flattened your IV and advanced the catheter, after which you were able to aspirate blood and push fluids and meds. There is definitely an issue that comes up after your successful cannulation, and that is the alarming rate of dislodgement or infiltration/extravasation. There are two reasons why I think this is the case. The first is that these catheters are usually placed deeper and the way that we tape IV’s in non-difficult access patients is not enough when securing lines in our patients with difficult access. 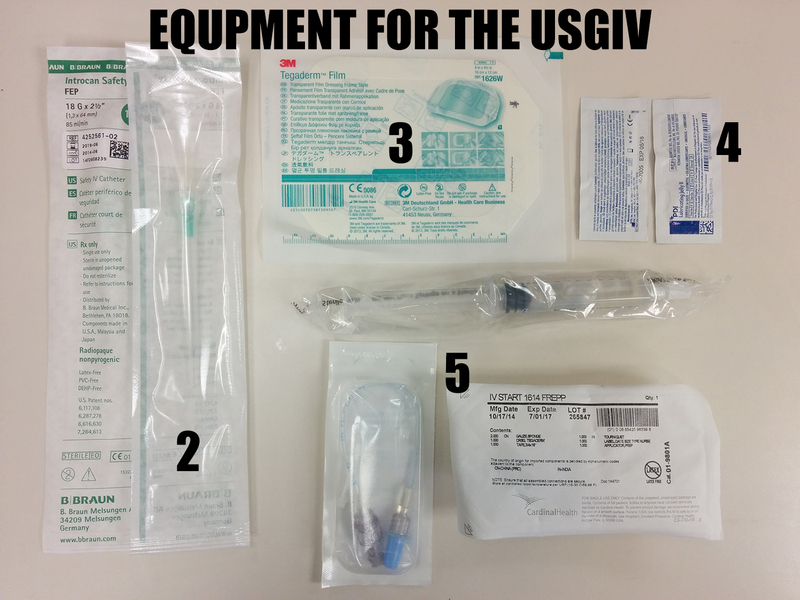 Below is how I tape my USGIV’s. 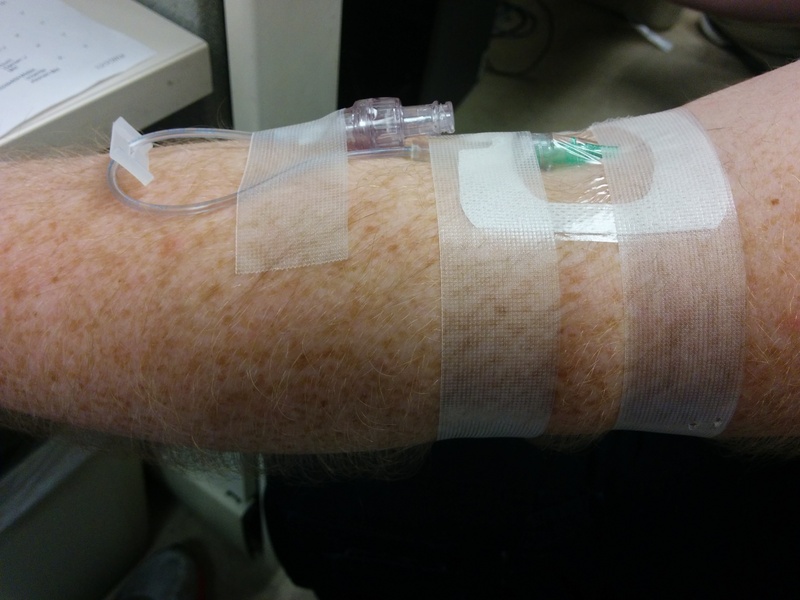 I use the IV tape and go circumferentially around the arm. This makes it more secure and bulkier, which in my mind will help the patient not wiggle the IV out as easily. Another question that needs to be addressed is the fact that we are often cannulating veins that are used for PICC lines and AV fistulas. To date there hasn’t been any research specifically addressing whether access to the deep veins cause any permanent damage, scaring or stenosis. One article states that “It is reasonable to avoid these veins [the deep veins] in any patient with ESRD, chronic renal insufficiency or severe underlying disease…that may lead to dialysis”. 7 This study, however, did not mention any data to back up that statement. A couple of studies reported that the veins get bigger and less compressible with a proximal BP cuff inflated to 150 mmHg. 8,9 However, when somebody actually tried getting IV access with BP cuff tourniquets the trial was stopped early due to provider frustration and patient discomfort.10 Just use the tourniquet. Special considerations in peds patients? These veins can be challenging due to the fact that they aren’t really that far beneath the skin surface,11 which means that you don’t have any wiggle room if you puncture the skin even a fraction of a millimeter off. In this population, don’t hesitate to go for leg veins. Is this a midline catheter? Which type of healthcare provider should be doing this? This technique has a short but very steep learning curve. It will be frustrating at first, but keep at it. You will get better at it. Remember that you’ve never done anything in your life perfectly the first time, and medicine is no exception. Procedures take practice, and this one is definitely worth it. Give it a shot and let me know what you think. 1. Bair AE, Rose JS, Vance CW, Andrada-Brown E, Kuppermann N. Ultrasound-assisted peripheral venous access in young children: a randomized controlled trial and pilot feasibility study. West J Emerg Med. 2008;9:(4)219-24. 2. Thomas S, Moore CL. The vanishing target sign: confirmation of intraluminal needle position for ultrasound guided vascular access. Acad Emerg Med. 2013;20:(10)e17-8. 3. Keyes LE, Frazee BW, Snoey ER, et al. 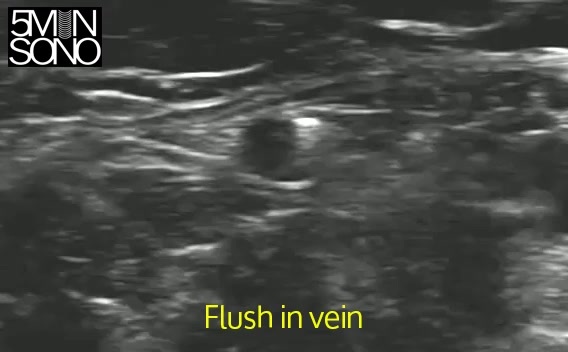 Ultrasound-guided brachial and basilic vein cannulation in emergency department patients with difficult intravenous access. Ann Emerg Med 1999;34(6):711-4. 4. Dargin JM, Rebholz CM, Lowenstein RA, Mitchell PM, Feldman JA. Ultrasonography-guided peripheral intravenous catheter survival in ED patients with difficult access. Am J Emerg Med. 2010;28(1):1-7. 5. Webster J, Clarke S, Paterson D, et al. Routine care of peripheral intravenous catheters versus clinically indicated replacement: randomised controlled trial. BMJ. 2008;337:a339. 7. 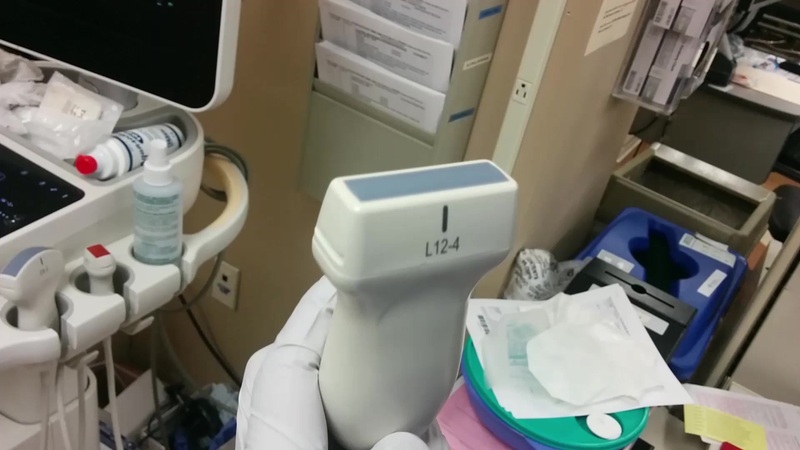 Schoenfeld E, Boniface K, Shokoohi H. ED technicians can successfully place ultrasound-guided intravenous catheters in patients with poor vascular access. Am J Emerg Med. 2011;29(5):496-501. 8. Mahler SA, Massey G, Meskill L, Wang H, Arnold TC. Can we make the basilic vein larger? maneuvers to facilitate ultrasound guided peripheral intravenous access: a prospective cross-sectional study. Int J Emerg Med. 2011;4:53. 9. Kule A, Hang B, Bahl A. 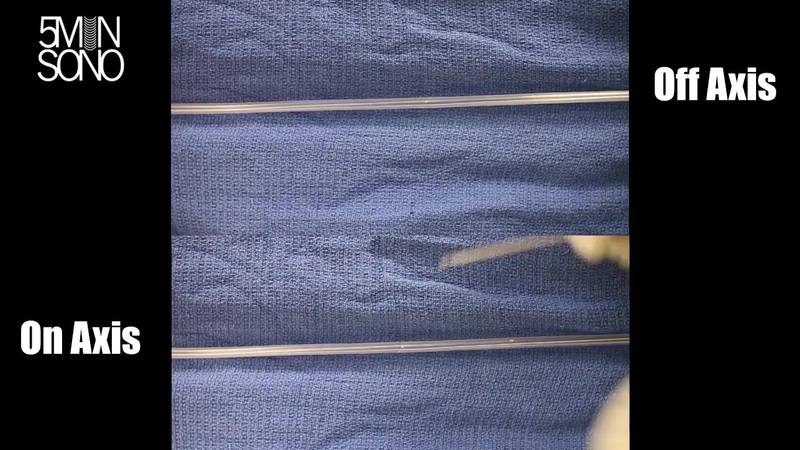 Preventing the collapse of a peripheral vein during cannulation: an evaluation of various tourniquet techniques on vein compressibility. J Emerg Med. 2014;46:(5)659-66. 10. Nelson D, Jeanmonod R, Jeanmonod D. Randomized trial of tourniquet vs blood pressure cuff for target vein dilation in ultrasound-guided peripheral intravenous access. Am J Emerg Med. 2014;32:(7)761-4. 11. Triffterer L, Marhofer P, Willschke H, et al. 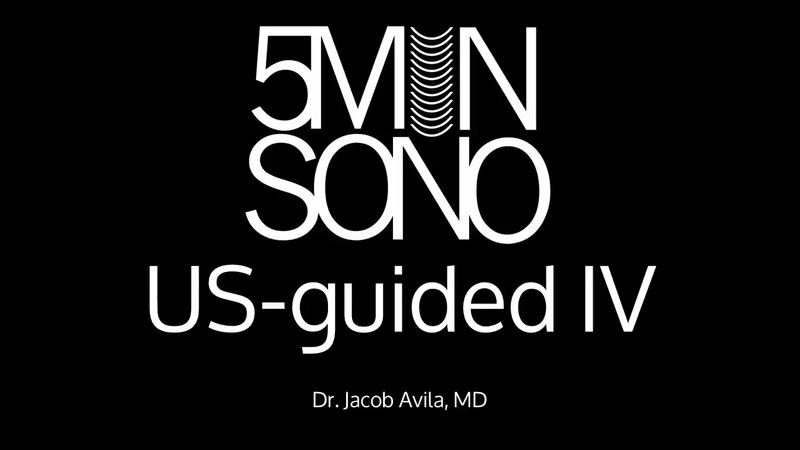 Ultrasound-guided cannulation of the great saphenous vein at the ankle in infants. Br J Anaesth. 2012;108:(2)290-4. 13. Gorski LA, Czaplewski LM. Peripherally inserted central catheters and midline catheters for the homecare nurse. J Infus Nurs. 2004;27(6):399-409. 15. Walker E. Piloting a nurse-led ultrasound cannulation scheme. Br J Nurs. 2009;18(14):854, 856, 858-9. 16. Mills CN, Liebmann O, Stone MB, Frazee BW. 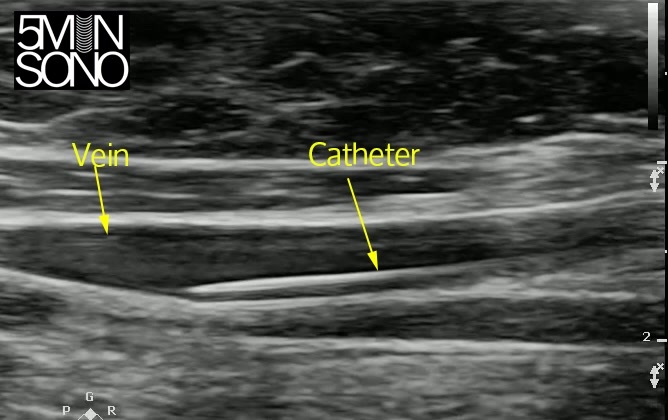 Ultrasonographically guided insertion of a 15-cm catheter into the deep brachial or basilic vein in patients with difficult intravenous access. Ann Emerg Med. 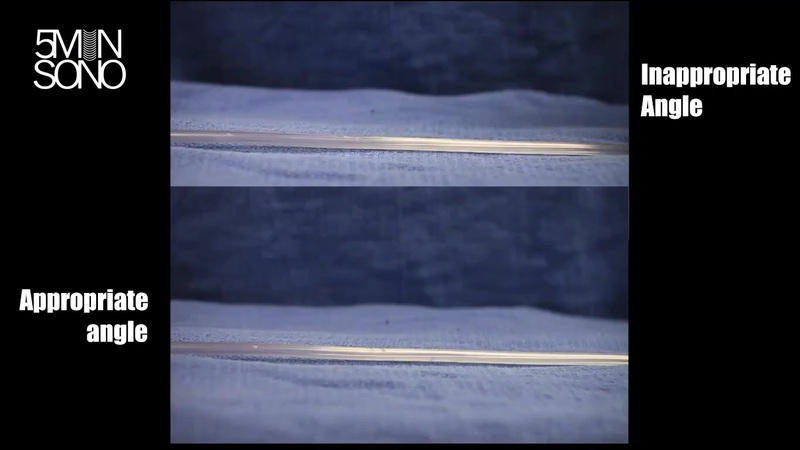 2007;50(1):68-72.
how far should the catheter be from the transducer probe when inserting the catheter. I always go the short version instead of the longitude way. Your skin puncture site should be as close to the transducer as physically possible. Thanks for putting this vascular access series together. It’s excellent and no doubt required some serious effort! The literature cited is great, as are the visuals. I’ll definitely refer this to colleagues, EM residents and students.